The wait is over for Office 2013 and Office 365. Starting Tuesday, the latest version of Microsoft’s venerable productivity suite goes on sale to consumers and academics, both on Microsoft’s Office.com site and at retail outlets. You can buy the traditional stand-alone desktop software or, for the first time, consumers and students can buy Office as a subscription service that will make multiple installations cheaper. 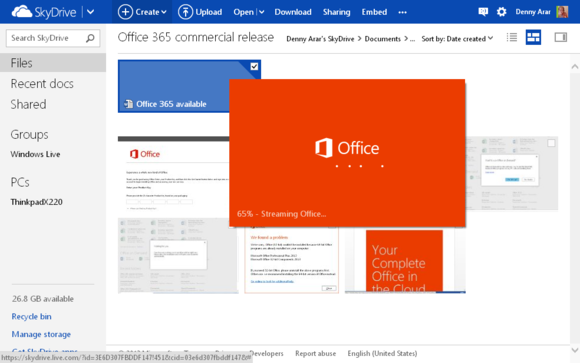 Along with assorted new features and a design overhaul, Office 365 subscription services introduce the much-touted "Office on Demand" feature that allows subscribers to access full versions of Office applications on Web-connected PCs. Windows users can still buy stand-alone versions of Office 2013 the old way (for prices ranging from $140 to $400). But if you need even the least-expensive edition on more than two or three computers in your household, you might wind up paying more than you would under the $100-a-year Office 365 Home Premium subscription plan (see our previous story on Office pricing), which covers up to five desktop installations (PC or Mac) versus a single installation for the stand-alone license. Here's the Office 365 online hub. For students, faculty members, and anyone else who qualifies for the Office 365 University license, the deal is even sweeter: Microsoft is charging a mere $80 for a four-year subscription that covers two desktop installations. Note also that the subscription licenses give you all the major Office apps, including Outlook, Publisher, and Access. The $140 Home & Student desktop software does not include those three apps; the $220 Home & Business edition adds Outlook but not the other two. To get Outlook, Publisher, and Access as well as the core Word, Excel, PowerPoint, and OneNote programs as desktop software, you must pay $400 for Office 2013 Pro. 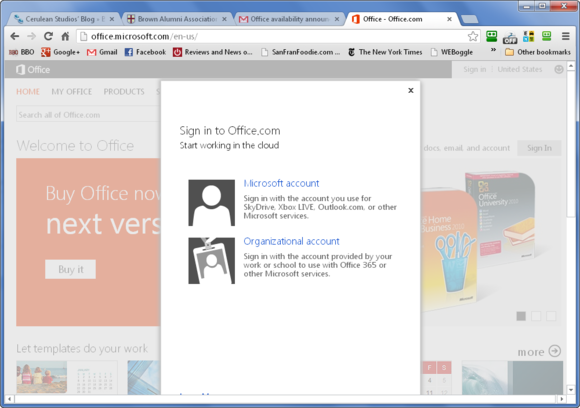 Mac users who sign up for Office 365 will get Office for Mac 2011. Office 2013 is PC only. Subscribers also get more SkyDrive storage space (20GB versus 5GB free) and 60 minutes each month of free Skype phone calls to 40 countries. Businesses interested in the subscription service still have to wait: Microsoft says it will begin selling Office 365 Small Business Premium (which adds Microsoft’s Lync unified communications and InfoPath forms support) on February 27. Streaming Office on Demand didn't work perfectly. Office 2013 has been available to IT pros, enterprises, and developers (read our review) since late last year, and the desktop software hasn’t changed in the meantime. (Microsoft has, however, posted system requirements.) But the Office 365 subscription services introduce new features such as Office on Demand for Web-connected PCs. We've heard no word from Microsoft on when Office on Demand for Android or iOS users might be available. Office on Demand has some system requirements: Windows 7 or 8 and a supported browser, namely Internet Explorer 9 or later, Mozilla Firefox 12 or later, Apple Safari 5 or later, or Google Chrome 18 or later. If you can’t run Office on Demand, you probably can still edit documents in Microsoft’s Web apps, which aren’t as full-featured but can certainly handle basic chores. Your Microsoft ID is central to the new Office experience. I tried Office on Demand by uninstalling Office completely on my laptop and setting up my Office 365 Home Premium subscription on Office.com. This process involves typing in a product key, much the way you would during the desktop-software installation, and linking it to a Microsoft account; I used my Windows Live account. 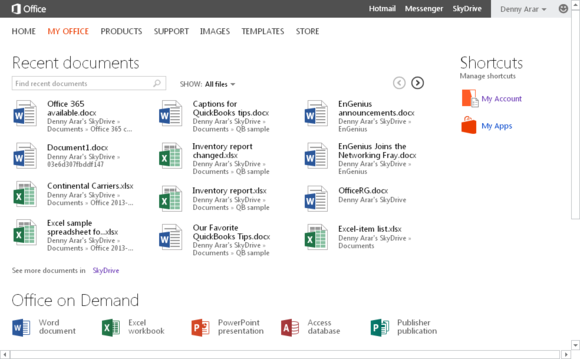 I then logged in via Office.com and immediately saw a My Office landing page that showed all my SkyDrive files as well as icons for accessing the on-demand apps: Word, Excel, PowerPoint, Access, and Publisher. Clicking one of the application links first brings up a tooltip suggesting that you’ll be creating a new document, and then produces splash screens informing you that the application is being streamed to your browser (Google Chrome showed a pop-up with more detail about the add-on). The application took about a minute or so to launch—but when it did, it looked like the real deal. Upgrading? Choose between 64-bit and 32-bit versions of Office. Alternatively, you can click an existing document in SkyDrive and then click an Edit Document link, which gives you the choice of working in the Web app or accessing the full on-demand app. Regardless of how I opened a document, I noted a slight delay in saving to SkyDrive. At one point the app was unable to save to SkyDrive (it said it was disconnected from the server) and saved the document to my hard drive. I also ran into an issue involving a conflict between a 64-bit installation of Office and a 32-bit version. Microsoft says an Office 365 license can cover a mix of 32- and 64-bit installations, but if you're upgrading from Office 2010, you cannot switch from the version of that installation. 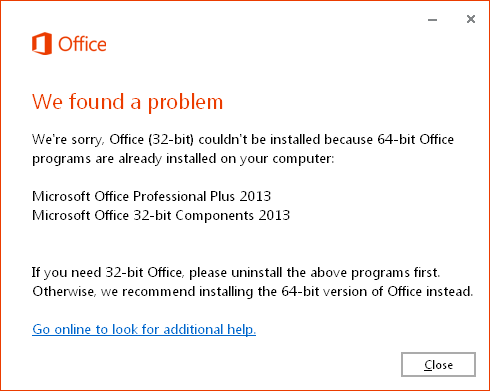 In other words, you can't upgrade the 32-bit version of Office 2010 to the 64-bit version of Office 365 and vice versa. If you don't have a previous version of Office installed, you can choose either version, but unless you frequently work with large data sets, Microsoft recommends using the 32-bit version, even if you're running a 64-bit version of Windows. The cloud-connected Office 365 is potentially a game changer for Microsoft's Office franchise. In its current incarnation, however, Office on Demand doesn't offer the type of flexibility and consistency you'd hope for with a Web-friendly version of Office. We are also still eagerly awaiting versions of Office that will work with an Android tablet and an iPad mini; be sure to read more about the many faces of Office, including details about what you can and can't get on mobile devices.